At the heart of religious life at St. Olaf College is the St. Olaf College Student Congregation, a congregation of the Evangelical Lutheran Church in America. It is our mission to provide worship, study, and service opportunities for students, faculty, and staff. There are many ways to get involved with the student congregation: worship at Boe Memorial Chapel, engage in a learning opportunity, enjoy a community meal or participate in a service project. Our College Pastors, Matthew Marohl and Katherine Fick, talk frequently with students of all backgrounds about issues of life and faith. Email them for an appointment or stop by the office. In addition to the ministry offered by the St. Olaf Student Congregation, the College Ministry Office is also the hub of inter-faith life. It is an honor and pleasure to serve as advocates and supporters of the study and practice of religion for all students, faculty and staff. Students also lead and participate in a variety of religious organizations with each group offering worship and education opportunities. 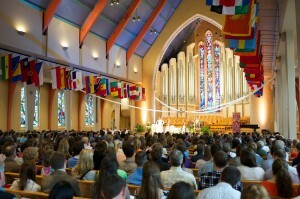 St. Olaf places great value on the study and practice of religion. We invite you to explore, to ask questions, and to grow in your faith. Additional hours flexible and available via appointment.